Announced at CES 2013, samDock broke ground as the first & only cable dedicated to connecting Samsung Galaxy devices to iPod speaker docks & audio systems. If you’re a Galaxy SIII or Note user, it’s never been easier give your favorite Android device access to the wide world of 30-pin audio docks currently on the market (and getting cheaper by the day!). One simple connection to charge your device and listen to your favorite tunes in stunning quality. Don’t believe us? Check out our samDock video above to see it in action. Presenting CableJive’s New LineOut Pro Cable! We’ve been selling audio cables for years now, but today we’ve officially gone “Pro” as we announce our new LineOut Pro cable! When you want the cleanest, purest sound from your iPod, iPad, or iPhone, you’ll want to access the professional-grade line level audio signals from your device’s 30-pin dock connector. The LineOut Pro is a premium quality line out dock cable that delivers those crystal-clear audio signals wherever you need them. This durable, flexible, 3 foot long cable can adapt to any audio situation. Connect it to your home theater, plug it into your car stereo, go direct into a mixer, or take it into the studio and really get creative. It features a high quality gold-plated 3.5mm connector and our custom-built male 30-pin housing so you’ll be able to plug this cable in no matter what case, cover, or skin you protect your device with. The LineOut Pro cable is available now! 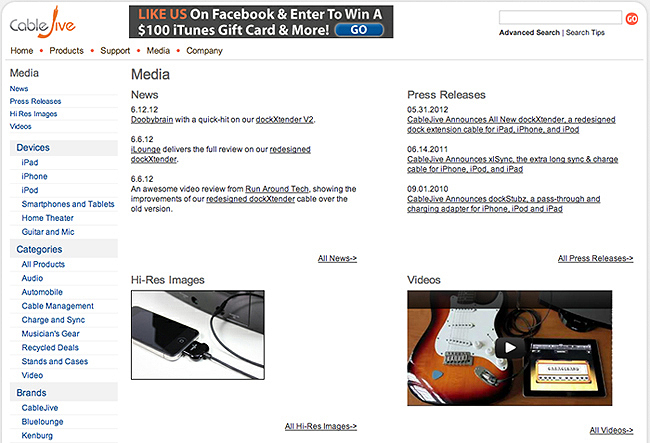 CableJive’s New Media Page Is Live! CableJive has been getting a lot of coverage lately. Don’t get us wrong, we love it! In fact, we’re so excited about it, that we decided to make it even easier to find all the latest CableJive news & media! The “News” section is where you’ll find new & old media coverage of everything CableJive. Previews, reviews, and everything in between. The “Press Releases” section is where you can catch all our major “official” announcements. And lastly, you can find all of our CableJive Videos in the “Videos” section. Just as I did with the ProJive XLR cable last month, I filmed a quick video showing how easy it is to connect the ProJive Instrument cable to play and record an electric guitar through an iPad, all while sending the audio out through a separate speaker system. See for yourself, then get yours and get-to rockin’!